You can do it... at home! : Whole Wheat Croissant - not as indulgent, is it? A blog sharing my first-hand experience at cooking & baking. A self-taught home cook/baker who wants to show you that anyone can do it with the right tools, attitude and knowledge. You can do it... at home! Whole Wheat Croissant - not as indulgent, is it? At last, I bought Advance Bread and Pastry book by Michel Suas after seeing many good reviews about it from online baking community. This is a very comprehensive book on bread and pastry gearing towards professional bakers, which is also highly beneficial for serious home bakers. Flipping through the book made me feel like reading a university textbook. In fact, it is a textbook for bread and pastry students. The book is gigantic (over 4 kg in weight) and covers aspects of bread and pastry extremely well. It is like combining all the books that I have in one. The first chapter I had a look was Viennoiserie (sweet enriched bread and pastry). I was excited to see many varieties of croissant recipes. There are ones made with poolish, with preferment, with sourdough starter, and whole wheat croissants made with straight dough and preferment. I have been practicing making croissants/laminated doughs for the past weeks and was intrigued by whole wheat croissants idea. Wouldn’t it be nice to include wholegrain into buttery croissant? At least, I won’t feel too guilty having them. I chose the recipe made with preferment, which I believe it enhances the flavour of the baked good. The recipe contains 20% of whole wheat flour (in baker’s percentage term). There is no milk in the dough, but it has egg yolks instead. The recipe calls for osmotorelant yeast (special type of yeast suitable for sweet and enriched dough), which I had no access to. So, I used the instant dry yeast and increase the amount a little to compensate. The dough was relatively easy to work with during rolling and butter lamination. It could be the result of my improved lamination skills through lots of practices. I also think that egg yolks helped softening the dough and made it more pliable. These were great tasting croissants and full of flavours. It had subtle nuttiness from whole wheat, great sweetness from malt and preferment. And whole wheat was hardly noticeable in the baked croissants. It was a good alternative to traditional croissant and it was sort of comforting to, at least, have a healthy wholegrain croissant. Note: I have been making croissants and laminated dough using recipe from Bourke Street Bakery cookbook and the recipe can be found here. Make the pre-ferment, mix all ingredients together in a bowl until it becomes a ball. Knead it for about 5 minutes until becomes elastic and smooth. Put the pre-ferment in a bowl covered with plastic bag and leave at room temperature for 1 hour for fermentation. After that, store the pre-ferment in the fridge overnight (this can be kept for up to three days in the fridge). To mix the final dough, divide the pre-ferment into 8-10 small pieces, mix it together with all other ingredients, except roll-in butter, in a mixing bowl until a dough ball is formed. Transfer the dough ball to a bench and knead for 10 - 15 minutes (by hand) until the dough become smooth and elastic, and doesn't tear when stretched gently. If using electric mixer, using dough hook, mix on low speed for 3 -4 minutes, followed by high speed for another 2 minutes. Put the dough in a bowl covered with plastic bag or cling wrap and ferment at room temperature for one hour. After fermentation, refrigerate the dough for one more hour. 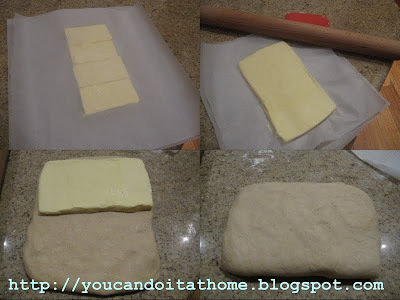 Preparing roll-in butter for lamination: Remove the butter from the fridge. Pound the butter with rolling pin between two sheets of baking paper into neat even rectangle or square with 5-mm thickness. If the butter becomes too soft, store it in the fridge for 15 minutes before using. Take the croissant dough out of the fridge, using a lightly floured rolling pin, roll the dough out into twice the size of butter block (roll-in butter). Place the butter in the centre of the dough and fold the dough over the top. Seal the edges of the dough together to ensure the butter is completely enclosed in the dough. Gently and carefully roll the dough out into a rectangle three times longer than the piece you started with. Mentally divide the rectangle into three equal sections, top, middle and bottom. Fold the top section over the middle, and fold the bottom to the middle, like folding a letter. Wrap the dough in a plastic bag or cling wrap and refrigerate for (at least) 30 – 60 minutes. Take the dough out of the fridge and rotate the dough 90 degree so that the dough will be rolled in opposite direction from previous fold. Repeat the rolling, folding, and resting process as above two more times. There will be three foldings and rollings (the term is “three turns”) altogether and you need to rotate the dough 90 degree with each rolling. After the final rolling and folding, store the laminated dough in the fridge for 40 - 60 minutes before shaping into croissants. Make the egg wash by mixing all ingredients together in a bowl and set aside. 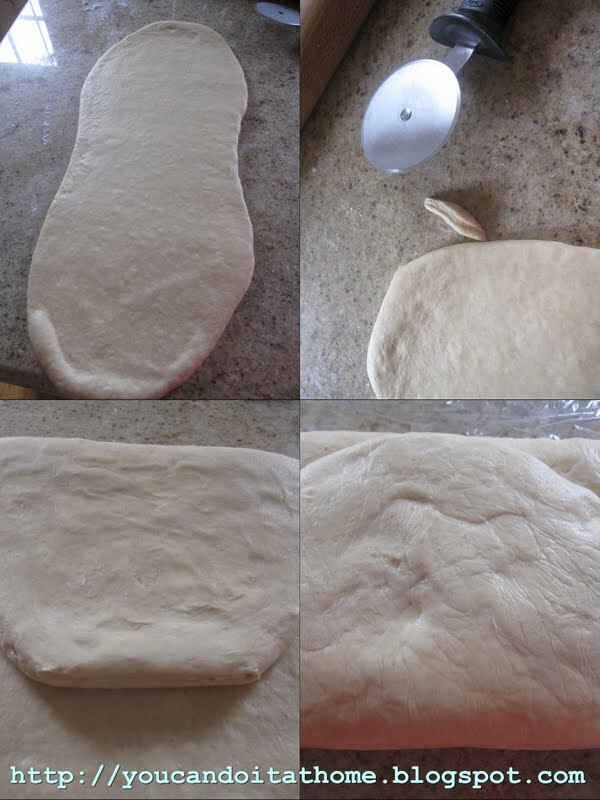 Take the laminated dough out of the fridge and roll it out into a rectangle about 25 x 50 cm with 5-mm thick. Trim the edges of the dough so that it becomes a neat rectangle. 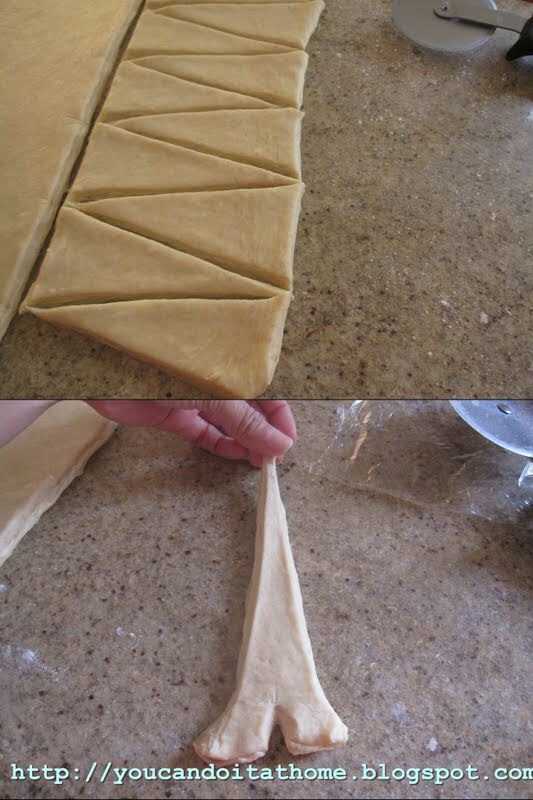 Cut the dough into triangles with 9-cm base and 21-cm height. Stack triangle sheets on baking sheet/papers and chill for 10 minutes. Take the chilled triangles out of the fridge and shape into croissants. Gently pull the tip of triangle to make the triangle longer. Make 1-cm incision at the base of triangle. Pull away two corners at the base and roll it towards the tip. Make sure that the tip is tucked underneath the croissant. Place shaped croissants on trays lined with baking sheet or paper. Note: Shaped croissants can be retarded in the fridge overnight and bake the next day. Take them out of the fridge next day and follow the proofing and baking steps as below. Note: it is important that croissants are fully-proofed before baking. Fully-proofed croissants are soft, wobbly like jelly. The laminated layers will also be seen clearly. Preheat the oven to 240c. 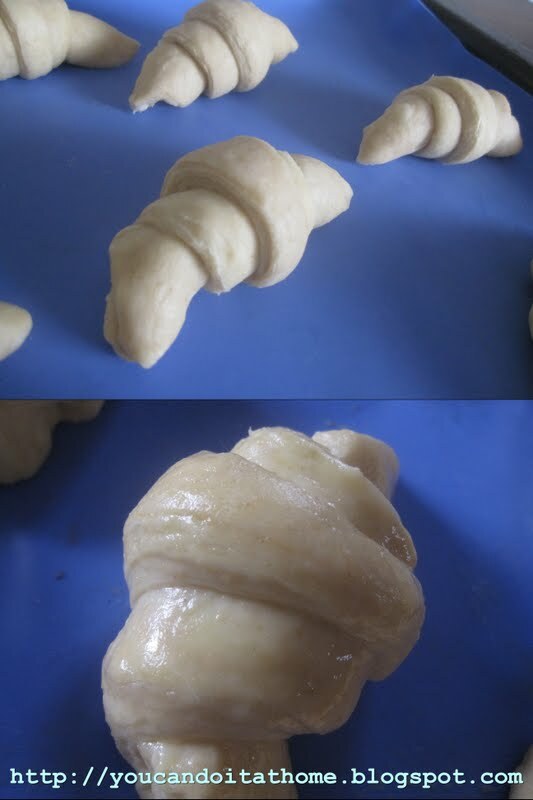 Brush the surface of croissant with egg wash before baking. Reduce oven temperature to 190c and bake for 20 - 25 minutes until it is deeply golden brown. Submitting this post to YeastSpotting. I like Suas book very much. My colleagues call it "current protocols in breadbaking" according to the big book "current protocols in plant biology" we have in lab. Your croissants look very delicious - I like the version with whole wheat very much. I only had the book for few weeks, and so far, really love it. It is the ultimate baking book for professional or wannabe and serious home baker alike. Thanks for the complement on the croissants. Beautiful Croissants! I was working with laminated dough as well this week and made Danish. It was a lot of fun. You have inspired me to bake up some Croissants! Working with laminated dough is fun and satisfying (not only the house filled with buttery aroma, they are also delicious, nothing beat freshly baked croissants/pastries). what type of butter do you use? does it has to be of high fat content? over here, we have what they call 'pastry margarine' meant for danish pastries..
hi lena...I used cultured butter. I've tried Australian made cultured butter, normal butter and lately, Lurpak (Danish cultured butter). I found cultured butter is easier to work with. It's more pliable, rollable...The fat content is around 82%. From what I read, it's not about the fat percentage, but it's more about quality of the fat in the butter, and the way cultured butter is made contribute to better characteristic of butter. I also read about magarines as a preference in commerical bakeries simply because it's easier to work with, less melting, more pliable. But you will lose the buttery rich taste at the expense of the practicality. For home-made croissant, I prefer to work with butter. Lemon Madeleines - a yummy snack in a flash! Basic Macarons Recipe: Italian meringue method - Now, I'm a convert! Rosewater Buttercream Macaron - Dare I compare to Laduree?